Academic Book Week (#AcBookWeek) is a week-long celebration of the diversity, variety and influence of academic books throughout history run by the Booksellers Association, returning for a fourth year from 4-9 March 2019. This week, The Source will be recognising the important role of academic books, including how they engage critical audiences such as the media and policy-makers, as well as reflecting on their evolution and what the future might hold for this research format. This blog focuses on open access book publishing. Springer Nature publishes open access books and chapters under its SpringerOpen, Palgrave Macmillan and Apress imprints. We helped to pioneer open access book publishing, first piloting open access publication for books in 2011. We have published more than 650 open access books across a wide range of areas in science, technology, medicine, the humanities and social sciences. But what does open access publishing offer you as an author? And what do our authors have to say about it? Open access is playing an ever-increasing role in academic book publishing, as authors aim to reach more readers, influence policymakers, work on collaborative projects and fulfil funders’ open access mandates. Other benefits include helping authors’ careers through the wider exposure their research gains. Worldwide, readers can now download for free over 15,000 open access books and chapters from more than 300 publishers via the Directory of Open Access Books (DOAB). 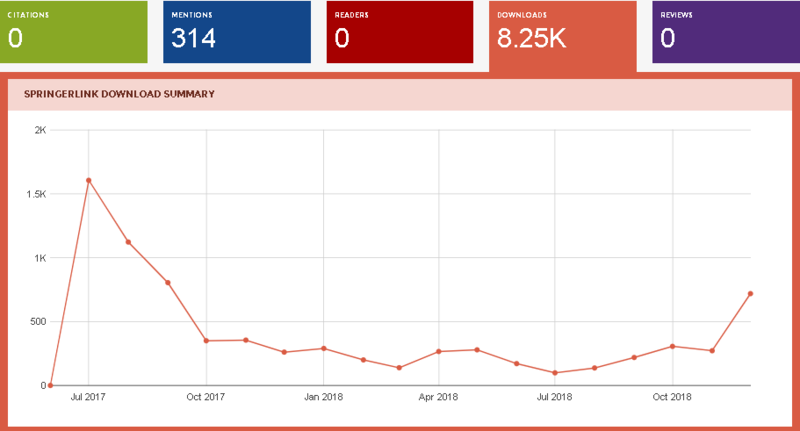 During last year’s Academic Book Week event ‘Explore Open Access Books’, Prof. Owen Davies, (History, University of Hertfordshire) talked about how his open access book* showed higher usage and downloads with 5,000 chapter downloads and 250 online mentions in less than a year. All open access content we publish adheres to the high standards expected of all Springer Nature titles with the same rigorous peer-review process. In addition to this, some authors feel strongly about the importance of their research being available to anyone, anywhere. Open access books are easier to promote as they can be more easily shared and accessed, plus they are more discoverable as we make them available through other platforms such as Google Books, Apple iBooks and Amazon. But what else can help your research be read more widely? Whilst we have dedicated marketing teams to ensure the best market coverage for your book on a global basis, nothing beats authors using their own networks and social media for promotion to help increase the impact of their research. Some of our open access book authors recommend Twitter as an effective tool to promote their work. ResearchGate, YouTube, and the importance of in-person meetings with the right stakeholders were also mentioned as tips. You can also use other channels such as creating your own online author profile and website, writing blogs, presenting at conferences, and participating in forums and online communities to name a few. Read more about these tips in our book marketing guide for authors or in our author guide to open access books. How can I publish an open access book? If you think that this all sounds great and you want to publish an open access book, then the next question is how to get funding for the book processing charge (or BPC) to cover all the costs of commissioning, copyediting and proofreading, production, dissemination and promotion of your work, including online hosting and indexing. directing you to the open access funding co-ordinator at your institution or funding body. Check out the Funding and Policy Support Service webpage to learn more. Then get in touch with one of our commissioning editors to discuss your proposal with them. Source: The OA Effect: how does open access affect the usage of scholarly books? *** Healthcare, Frugal Innovation, and Professional Voluntarism: A Cost-Benefit Analysis (Palgrave Macmillan, 2017), Authors: Ackers, L., Ackers-Johnson, J., Chatwin, J., Tyler, N.